Hemp never cared for recognition or fame, but lately, it seems that everywhere we look, we see the plant’s influence and progress. The Hemp Business Journal estimates the U.S. hemp industry reached $593 million in sales in 2015 and will grow to around $2 billion in sales by 2020. Many of us are already familiar with these products – the nutritionally packed hemp foods that line supermarket shelves, the beautiful array of hemp clothing and fabrics, the medicinal CBD oils and other hemp extracts, the hempcrete used in eco-friendly construction, and even the energy-storing nano-materials made of hemp. 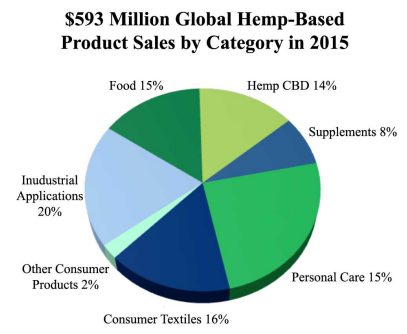 Yet for the last decade, while this hemp revival has been skyrocketing all over the world, the U.S. hemp market has relied mostly on imported hemp. Of course, this is due to the antiquated regulations that categorize the entire cannabis species as one illegal substance, ignoring its two main categories – hemp, with virtually no THC, and marijuana, with its psychoactive effects. Thankfully, at this stage in our collective evolution, we are “hemp-owering” ourselves by remembering the knowledge and benefits of non-psychoactive cannabis strains. This information is seeping back into our everyday lives and we are no longer willing to put up with outdated laws that hinder our progress towards a cleaner, more efficient, and conscious way of living. Educating ourselves and each other is a crucial step in the right direction. We must uncover the facts and vote with our actions and our dollars, supporting wholesome alternatives to our usual ways. The unrelenting pushback from the oil & gas industry is an extreme reaction to the undeniable evidence of manmade climate change; how wonderful would it be to have the option of being proactive and preventive in healing our planet? The good news is that we have plenty of options, and industrial hemp is one of the most promising! We finally have the social platforms and technologies we need to support the creation of a more compassionate coexistence with our ecosystem. With the power of communication at our fingertips, progress is imminent. The 2014 Farm Bill created more opportunities for hemp, allowing for industrial hemp cultivation without a permit from the DEA. The federal government now allows farmers to partner with state agriculture departments and higher learning institutions to plant “pilot projects” on U.S. soil. China has been producing hemp textiles and paper for over 600 years, and Europe still leads the hemp revolution for climate change solutions regarding hemp’s ability to sequester carbon, yet laws governing industrial hemp within the U.S. have now present in a total of 33 states! Rhode Island’s “Hemp Growth Act” went into effect on January 1, 2017, and individuals are now allowed to obtain a state license to cultivate hemp for clothing, food, and other commercial products. This is an immense win, as hemp is now treated as an agricultural product that may be legally produced, possessed, distributed and commercially traded. We still have a long way to go until we reach full federal commercial legalization, which will drastically improve the U.S. economy and our environmental healing; however, the hemp market momentum continues to increase visibly on mainstream media. New segments advocating for the commercialization of hemp products are being published everywhere, even on television with shows such as “Weed” on CNN, advocating for high-CBD oil treatments to fight disease. Federal changes take time, and while we have more influence on this progress now than ever before, we need to continue to make an impact at an individual level by supporting local hemp businesses and sharing educational information with our communities. Hemp plants sequester 4x more carbon dioxide than the average tree. It would take only 6% of U.S. land to produce enough hemp fuel to make us energy independent from the rest of the world. At Sana Packaging, we are doing our part in transitioning away from petroleum-based materials, to a wholesome system that fully supports all life on this planet. Let’s “hemp-ower” this progress together!